Fine Gael MEPs Seán Kelly, Mairead McGuinness, Brian Hayes and Deirdre Clune have jointly nominated the Irish Men’s Sheds Association for the 2018 European Citizen’s Prize. The prestigious award recognises projects or individuals that promote cross-border cooperation and EU values. 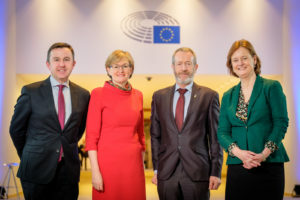 In proposing the Irish organisation for the accolade, the Fine Gael Delegation said the movement “has distinguished itself in strengthening European integration”. “The Men’s Sheds motto is ‘Men don’t talk face to face. They talk shoulder to shoulder’. It creates a space where men can otherwise discuss health issues and emotions while engaging in purposeful activities. This advances the health and well-being of the participating men by combatting issues such as loneliness and isolation while creating a culture where men can openly discuss their thoughts and feelings without stigma. “It has shown how integration is one of its key values by being a dedicated, friendly and welcoming meeting place where men, regardless of age, background or ability, come together and undertake a variety of mutually agreed activities. These activities include carpentry, bike and vehicle repairs, upholstery, gardening, bee keeping, painting, singing, developing IT skills, and playing cards,” the four MEPs stated in their official nomination. The European Citizen’s Prize celebrates projects and initiatives that facilitate cross-border cooperation or promote mutual understanding and EU values. Winners will be announced later this year ahead of an official prize-giving ceremony at the European Parliament, Brussels in October. This nomination follows the successful submission of the Irish youth organisation, Foróige, by the Fine Gael/EPP Group MEPs last year which won the 2017 European Citizen’s Prize.